The Niagara Falls Thunder opened their program with a 4-1 victory over the Pittsburgh Vengeance in USPHL junior hockey action Saturday evening at the Alpha Ice Complex in Pittsburgh. The Thunder is a new team in the Northeast of the Premier Division. The Vengeance moved over from the NA3HL and play in the Great Lakes of the Premier Division. The Thunder play their home games at the Hyde Park Ice Pavilion in Niagara Falls. Tristan Englehart scored the first goal in Thunder history on the power play late in the first period. Brandon Schweickert and Spencer Hrynczak provided the assists. The Thunder carried that 1-0 lead into the first intermission. Pittsburgh tied the game on a goal from Michael Hertzberg at 2:30. Anthony Purdue was credited with the lone assist on the play. Joe Shanley gave the Thunder the lead again at 9:09, with help coming from Kevyn McElligott and Jeremy Ienco. Jared Hayden extended the Thunder lead 7:32 into the third period. Jacob Hurd assisted. Fifty-two seconds later, Englehart capped the scoring for the evening with his second of the night. Shanley assisted for his second point of the night. Goaltender Ryan Pascarella turned away 29 of 30 shots while picking up the win for the Thunder. Charlie Olsson stopped 25 of 29 for the Vengeance. Niagara Falls and Pittsburgh will face off again Sunday morning at 11:40 at the Alpha Ice Complex. The Thunder will play their first games at home on September 28th and 29th when they take on the Connecticut Nighthawks. Game times are set for 7:30pm and 6pm, respectively. 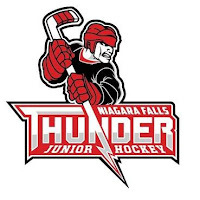 1st Period-1, Niagara Falls Thunder, Engelhardt 1 (Schweickert, Hrynczak), 17:47 (PP). Penalties-Rosengard Pgv (tripping), 12:28; Ventura Pgv (cross-checking), 17:00. 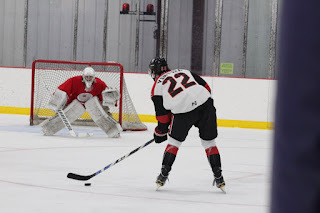 2nd Period-2, Pittsburgh Vengeance, Hertzberg 1 (Purdue), 2:30. 3, Niagara Falls Thunder, Shanley 1 (McElligott, Ienco), 9:09. Penalties-Ienco Nft (tripping), 5:07; Zwieg Nft (roughing), 9:54; Shanley Nft (roughing, slashing), 15:11; Purdue Pgv (roughing), 15:11. 3rd Period-4, Niagara Falls Thunder, Hayden 1 (Hurd), 7:32. 5, Niagara Falls Thunder, Engelhardt 2 (Shanley), 8:24. Penalties-Faliero Nft (roughing), 8:54; Mock Nft (misconduct-unsportsmanlike), 16:26; Kirk Pgv (misconduct-unsportsmanlike), 16:26; Jenkins Pgv (tripping), 16:43; Duderstadt Pgv (cross-checking), 18:53. Shots on Goal-Niagara Falls Thunder 8-7-14-29. Pittsburgh Vengeance 12-10-8-30. Power Play Opportunities-Niagara Falls Thunder 1 / 4; Pittsburgh Vengeance 0 / 4. Goalies-Niagara Falls Thunder, Pascarella 1-0-0-0 (30 shots-29 saves). Pittsburgh Vengeance, Olsson 0-1-0-0 (29 shots-25 saves).